I am usually green and range in size by species from 1 to 5 inches. My antennae are two or three times the length of my body. 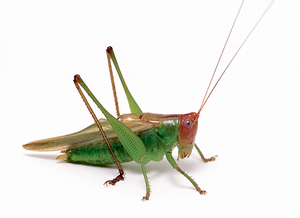 I eat leaves, flowers, the stems, and fruits of many plants and a few species of katydids are predators and will eat other insects. I can be found on branches of trees or bushes in North America and other parts of the world. I am most active at night and sing in the evening. I go through three stages of development: egg, nymph and adult. My egg is laid in the fall on plants or in the soil and I hatch in the spring. Once I hatch as a nymph, I look like adults except without wings. I shed my skin (molt) to grow. As an adult I will have developed my wings. My lifespan is about one year from egg to the end of adulthood.